A healthy mouth is vital to Whole Health. An infection-free mouth is good for heart health, and a balanced bite can be the difference between pain and wellness. This is the essence of a Holistic Mouth, one that works for optimal health. 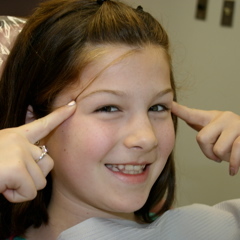 Optimal child development must include dental-facial alignment as a foundation to achieve Mouth-Body Health. Mouth-Body Health has some unmistakable features: radiance, energetic aura, and pleasing to view. Under that attractive surface, a balanced framework of skull and facial bones, jaws, and teeth provides optimal blood supply and neurological function. This collection of bones and jaws forms the home to the brain, eyes, ears, sinuses, tongue, throat. The Law of Form & Function says good health can only come from alignment of the Head-Neck-Back. Straight and wide jaws lead to good overall health, while crowded teeth from narrow jaws results in compromised overall health. That’s the conclusion of Dr. Weston A. Price, DDS, who traveled the world in the 1920-30‘s and documented that traditional diet often contribute to fuller dental and overall health compared to his patients in Cleveland, Ohio (1). The bite is a surface sign of the bony organization under the face. The human body develops from the head down (2). Straight teeth and wide dental arches means smooth and full genetic expression (3). 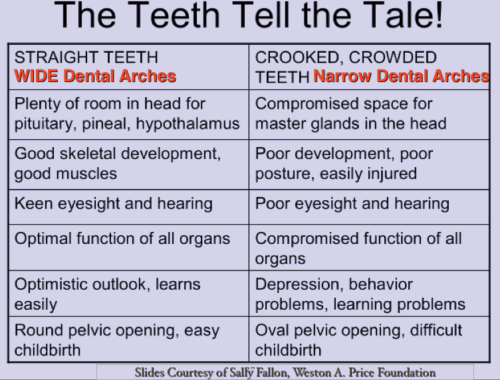 Crowded teeth and facial asymmetry signals a less favorable future medically and dentally. Dr. A.C. Fonders, author of The Dental Physician (4), confirmed Dr. Price’s work with more clinical details on the whole body effect of Dental Distress Syndrome. For more information, click here. The best time to set the foundation straight is before age 9. “Every orthodontic case started after age 12 is a compromise”, according to Dr. Jay Gerber, a leading orthodontic teacher at Center for Orthodontic Studies in West Virginia. Stay in touch with through articles, research findings, case progress and by joining The Holistic Mouth Doctor’s Newsletter. For more information, click here for additional articles, and register for Dr. Liao’s next lecture on Children’s Optimal Dental Facial Development by viewing the events page and calendar. My previous headaches were from a 3-4. Now since I have been working with you they have been from a 0-1. Thank you for helping me and my family!